Compact units require minimum space . Audible ballast with LED lamp out indicator. High output, low pressure Mercury vapor lamps with high isolation pin design. Compact design with 304 or 316 Stainless Steel reactor chamber, polished for laboratory and medical use. Easy servicing, no need to turn off water flow to change UV lamp. Open-end quartz sleeve and stainless steel gland nuts. Operating temperature and sealing efficiency. A natural quartz sleeve to protect the lamp and allow the maximum amount of UV rays to penetrate and disinfect the water. Polaris Scientific UV and the Polaris Scientific UV logo design are registered Trademarks in the United States and certain other countries. 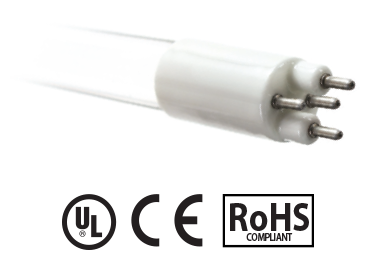 The Polaris Scientific UV Germicidal Lamp Pin Design is patented under United States Patent Number: D751506, Taiwan Patent Number: M 503904, China Patent Number: ZL 2015 2 0160464.9, Mexico Patent Number: 49882, and is protected by U.S. Patent and International Trademark laws. 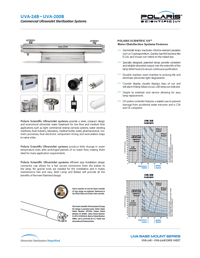 have a sleek, compact design and provide cost effective ultraviolet water sterilization for low to medium flow applications. 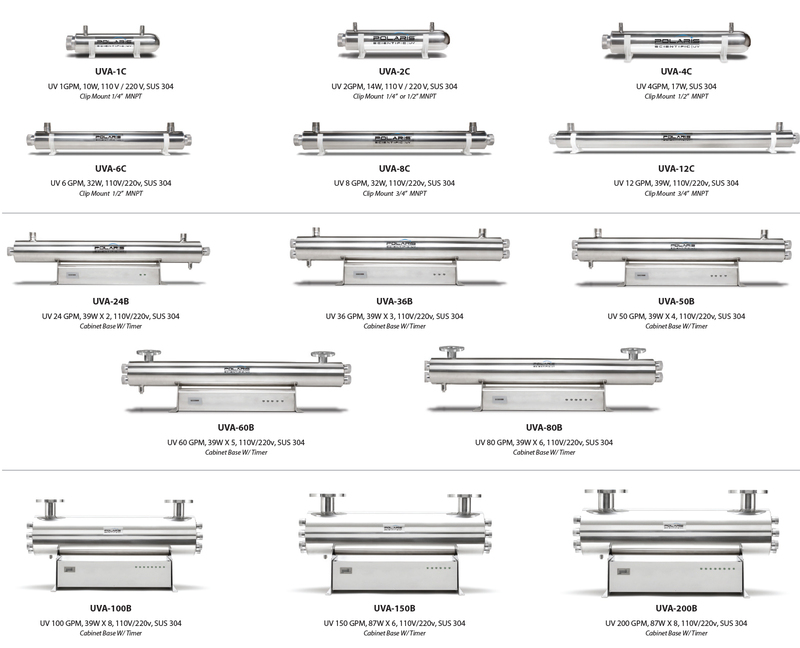 Polaris Scientific UV’s are perfect for residential and light commercial reverse osmosis systems, water vending machines, food industry, laboratory, final electronic component rinsing and recirculation loops to name a few. produce little change in water temperature even after prolonged periods of no water flow, making them ideal for many application requirements. Polaris Scientific Ultraviolet warrants the UV chamber on the Polaris Scientific Ultraviolet product to be free from defects in material and workmanship for a period of five (5) years from the date of purchase. During this time, we will repair or replace, at its option, any defective Polaris Scientific Ultraviolet chamber. Please return the defective part to the Polaris Scientific Ultraviolet dealer you purchased your system from, who will return it to Polaris Scientific Ultraviolet. We will either make the necessary repairs or, if it is determined that a replacement is required, we will provide a replacement part. We will then return the part to the dealer. This warranty does not include shipping and handling charges which will be collected from you by the dealer. Parts repaired or replaced under this five (5) year warranty will be covered under warranty to the end of the original five (5) year warranty period. This warranty is also subject to the conditions and limitations outlined under the heading ”General Conditions and Limitations” below. Polaris Scientific Ultraviolet warrants the structural, hardware, and electrical components to be free from defects in material and workmanship for a period of one (1) year pro-rated from the date of purchase. During this time, we will repair or replace, at its option, any defective parts covered by the warranty. Defective part(s) should be returned to a Polaris Scientific Ultraviolet dealer, who will return it to Polaris Scientific Ultraviolet. We will either make the necessary repairs or, if it is determined that a replacement is required, we will provide a replacement part. include shipping and handling charges which will be collected from you by the dealer. Parts repaired or replaced under this one (1) year pro-rated warranty will be covered under warranty to the end of the original one (1) year pro-rated warranty period. This warranty is also subject to the conditions and limitations outlined under the heading ”General Conditions and Limitations” below. Polaris Scientific Ultraviolet warrants original lamps, sleeves and UV sensors to be free from defects in material and workmanship for a period of one (1) year from the date of purchase. During this time, we will repair or replace, at its option, any defective parts covered by the warranty. The warranty period for lamps and sleeves may be verified using date codes in addition to purchase receipts and Polaris Scientific Ultraviolet’s database of serial number sales date. We will advise you whether the defective item needs to be returned to the Polaris Scientific Ultraviolet dealer you purchased the equipment from for failure analysis. 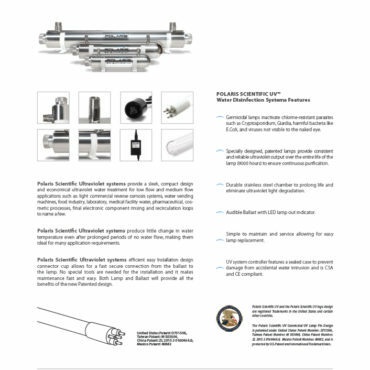 Replacement lamps and sleeves provided under warranty will be sent to your Polaris Scientific Ultraviolet dealer. If the UV sensor experiences a problem which Polaris Scientific Ultraviolet confirms is covered by warranty, please return the sensor to a Polaris Scientific Ultraviolet dealer you purchased the equipment from who will return it to us. We will either repair or replace the sensor and return the sensor to your dealer. This warranty on lamps, sleeves and sensors does not include shipping and handling charges which will be collected from you by the dealer. Parts replaced under this one (1) year warranty will be covered under warranty to the end of the original one (1) year warranty period. This warranty is also subject to the conditions and limitations outlined under the heading ”General Conditions and Limitations” below. None of the above warranties cover damage caused by improper use or maintenance, accidents, acts of God or minor scratches or imperfections that do not materially impair the operation of the product. The warranties also do not cover products that are not installed as outlined in the applicable Owner’s Manual. Polaris Scientific Ultraviolet System warranty will be deemed null and void if any of the product labels are removed, including the pressure sensitive hologram serial number. The limited warranties described above are the only warranties applicable to the Polaris Scientific Ultraviolet products listed in the ”Specific Warranty Coverage” section. These limited warranties outline the exclusive remedy for all claims based on a failure of or defect in any of these products, whether the claim is based on contract, tort (including negligence), strict liability or otherwise. These warranties are in lieu of all other warranties whether written, oral, implied or statutory. Without limitation, no warranty of merchantability or of fitness for a particular purpose shall apply to any of these products. Polaris Scientific Ultraviolet does not assume any liability for personal injury or property damage caused by the use or misuse of any of the above products. Polaris Scientific Ultraviolet shall not in any event be liable for special, incidental, indirect or consequential damages. Polaris Scientific Ultraviolet’s liability shall, in all instances, be limited to repair or replacement of the defective product or part and this liability will terminate upon expiration of the applicable warranty period. 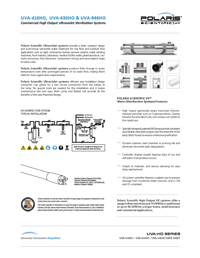 For complete product warranty, conditions and limitations, please refer to the Polaris Scientific UV catalog.